with included 1 1/4" aluminum handrail and triple in-between spindles. Black gloss powder coat finish with raised diamond pattern steel plate treads, continuous sleeves, and safety back lip up. 6'0" Diameter CODE Metal Kit with optional Hot Dipped Galvanized Finish, Diamond plate treads with bar grating inserts, and custom 90 degree landing. with included 1 1/4" Aluminum tube handrail, triple in-between spindles. Optional Balcony Rail. with optional oak treads, multi-line spindles, oak handrail and well railings with oak tops. Located in South Philadelphia. with optional oak treads, multi-line spindles, oak handrail and well railings with oak tops. with included triple in-between spindles, optional cherry tread & landing coverings, solid cherry handrail with finger groove (Design B), alternating small scroll & double scroll castings on in-between spindles, balcony landing railing, closed tread ends, continues sleeves, black powder coated finish and matching well railings. 5' 0" Diameter CODE Metal Kit with included triple in between spindles. Optional continuous sleeves, lip-up design treads, cherry treads and landing, stainless steel powder coated finished with round cherry handrail and cherry base plate covers. 5'0" Diameter CODE Metal Kit with included triple in between spindles. Optional continuous sleeves and Silver powder coat finish. 5'0" Diameter CODE Metal Kit with included triple in between spindles. Custom G4 tread design with continuous sleeves, black matte powder coat finish with 2" thick Walnut treads and "A" Groove handrail. 5'3" Diameter Architectural Series kit with included Powder Coat finish and wood treads (stained by owner). Optional Stainless Steel Multi-Line Railing System and loft railing. 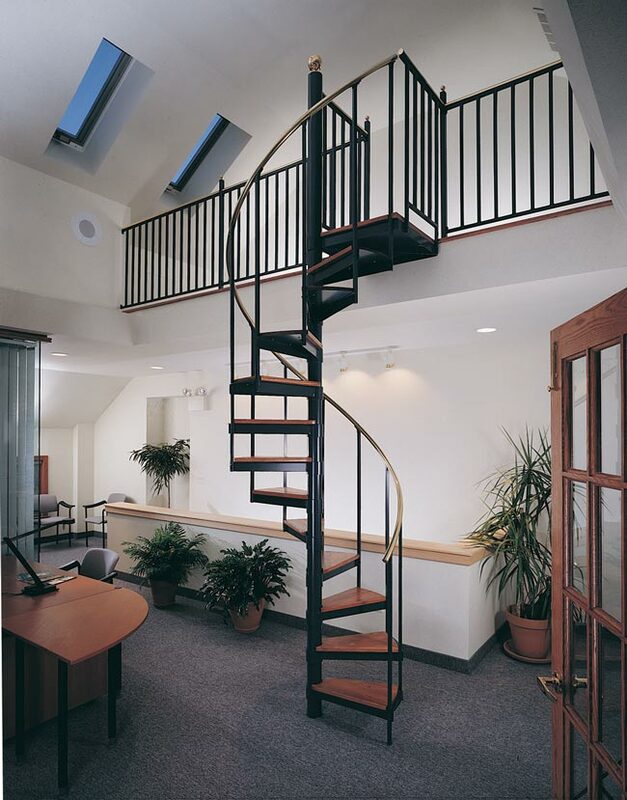 7' 0" Diameter Standard Metal Kit with included closed tread ends and optional LED lighting kit, Solid Hickory handrail, Stainless Steel Multi-Line Railing system, continuous sleeves, Hickory treads and Black Matte powder coat finish. 5'0" Diameter CODE Aluminum Kit with continuous sleeves, safety back lip up, matte black powder coat finish, and raised diamond plate treads. 5'0" Diameter CODE Aluminum Kit with continuous sleeves, safety back lip up, gloss white powder coat finish, and raised diamond plate treads. 5'0" Diameter CODE Aluminum Kit with continuous sleeves, Matte Black powder coat finish, bar grating treads and landing, and Stainless Steel Multi-Line Railing system. 4'6" Diameter Standard Metal Kit. Comes included with 1 1/4" Black Vinyl handrail, 3/4" Square Main spindles and a Black primer finish. 4'0" Diameter Standard Metal Kit with optional G4 Tread/Landing design, and single IBS with Fleur-de-lis Castings. Stair painted by owner. 5'0" Diameter CODE Metal Kit with optional Black gloss powder coat finish, Red Oak Tread coverings, Safety back lip up tread. 5'0" Diameter CODE Metal Kit with optional Black Matte powder coat finish, red oak tread coverings, safety back lip up tread and Stainless Steel Multi-Line railing system. 6'6" Diameter Standard Aluminum Kit with optional Satin Nickel powder coat finish, diamond plate treads & landing, Stainless Steel Multi-Line railing and an inside handrail per code.